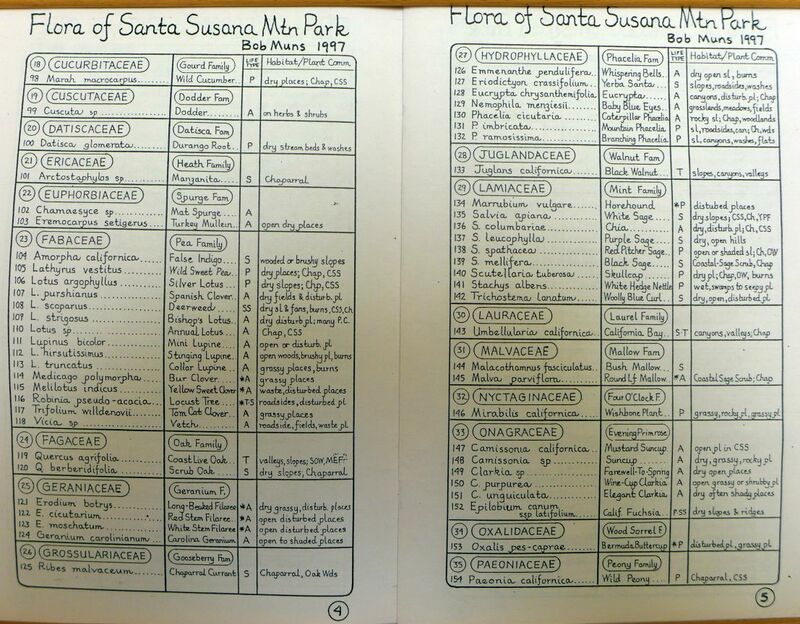 For over 20 years, Bob Muns has devoted himself to compiling plant lists for different places in Southern California, and communicating that information to other lovers of native plants. Bob has conducted countless plant walks for the Natural Science Section of the Sierra Club, teaching many people how to identify and appreciate our native plants. He provides written plant lists on each of those walks, which are of immense help in keeping track of the large amount of information conveyed on his walks. The printed plant lists are works of art as well as science. They compactly present all the essential information about each species in Bob's beautiful hand script. The lists are usually accompanied by illustrations drawn by Bob, and often contain more detailed information about selected species. The written plant lists are invaluable to those who follow in Bob's footsteps. Having a plant list in hand for an area vastly speeds up the process of trying to figure out exactly what plant species one sees in a given area. Finally, the scientific value of Bob's lists is enormous. 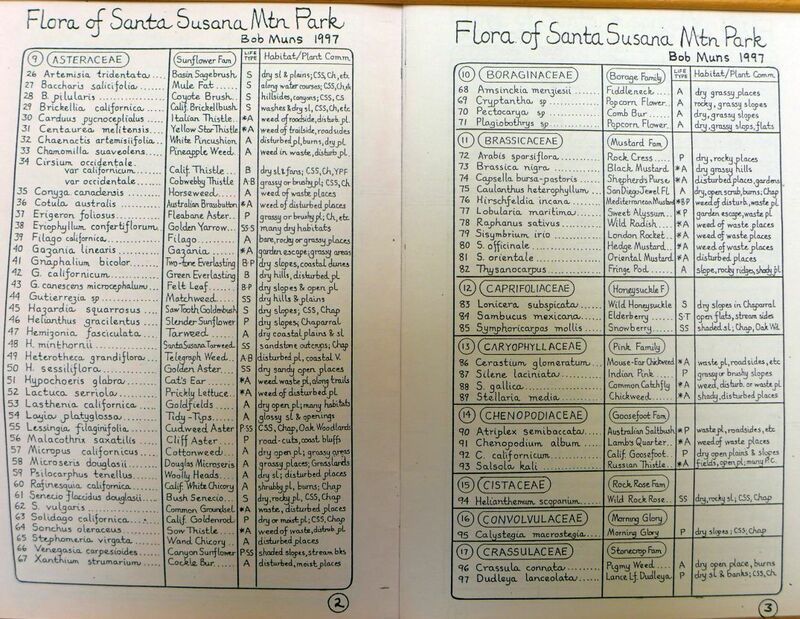 They provide a detailed record of the distribution of our native plants on a very fine scale. The full value of his lists has not yet been realized because to date they have been available only in printed format. 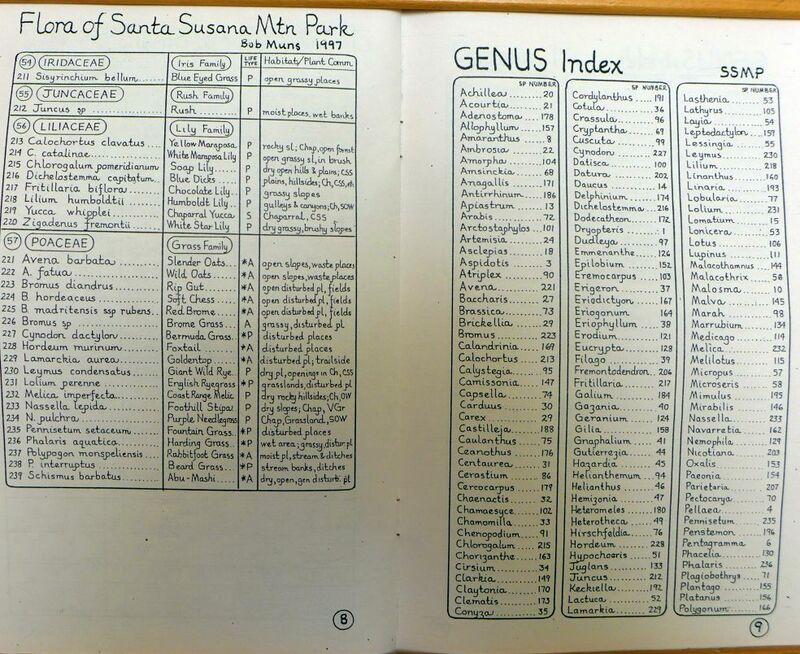 In 2002 I began a project to digitize all of his lists, with a goal of analyzing that information to summarize the distribution of each species in Southern California, with the help of Michael Charters for some lists. Unfortunately, we were only able to continue that project through 2004. I hope to find time in the future to resume digitizing those lists. 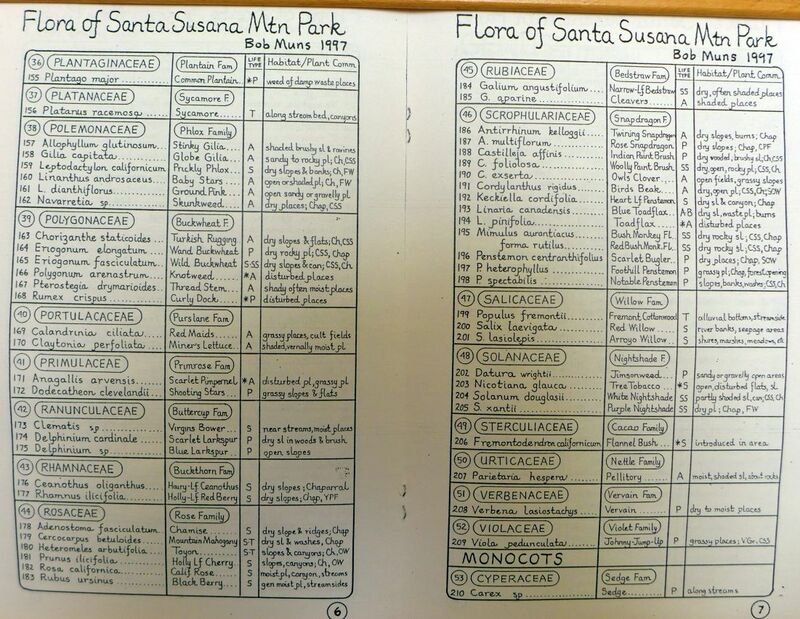 In 2010, Aaron Sims supplied a pdf version of Bob's very useful Plant Identification: Collection of Basic Information Sheets (size is 2.5 MB). Bob has kindly granted permission for anyone to print out that booklet as needed. That pdf will produce a booklet identical to Bob's original if you print it on double-sided pages (for a duplex printer, specify flip on long edge). Note that this booklet is dated June 1983 on the cover, but includes a non-paginated middle sheet (of four pages) with a 1993 summary from the 1993 Jepson Manual. Most of the printed lists are on sale at the Rancho Santa Ana Botanic Garden bookstore. They are no longer available from Bob directly. Bob makes all his publications freely available for use by anyone as long as they are attributed to him. 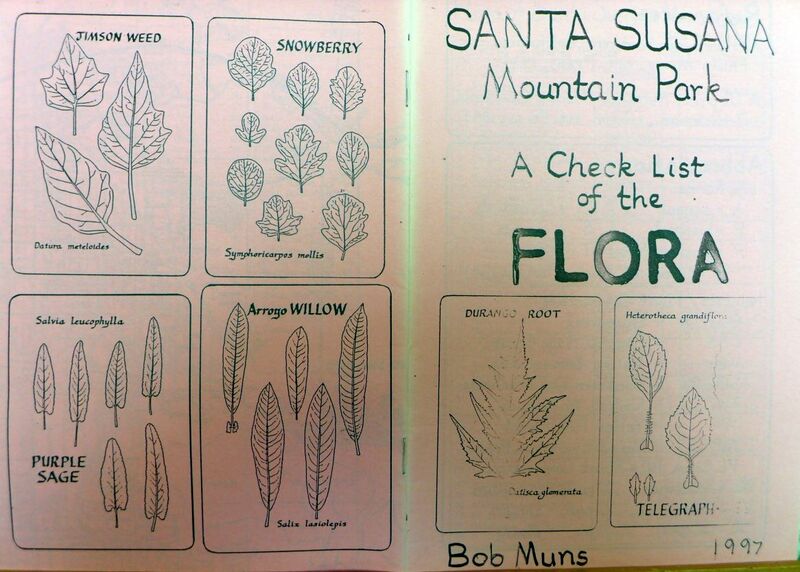 The San Gabriel Chapter of the CNPS has also begun scanning some of these booklets to preserve the full information presented in them, including Bob's original calligraphy and art work; see The flora checklists of Bob Muns. If a scanned booklet was online as of 1 April 2016, a link to it is given below with the name CNPS-scanned booklet. 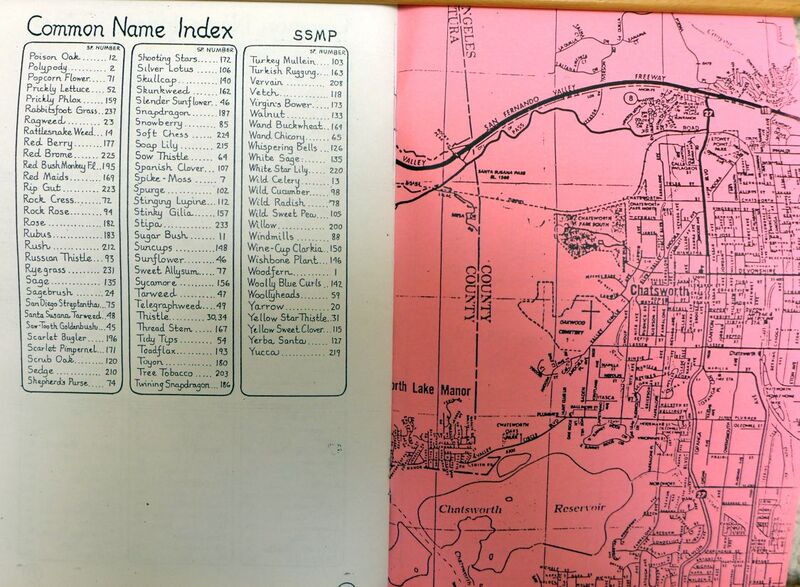 The lists are organized by the geographic subdivisions of Southern California as given in the Jepson Manual, 1993, and are ordered roughly north to south and then west to east, both for the subdivisions and within each subdivision. As each plant list is digitized, a link will be placed to the name below. Eventually, I will add a map showing all the locations. 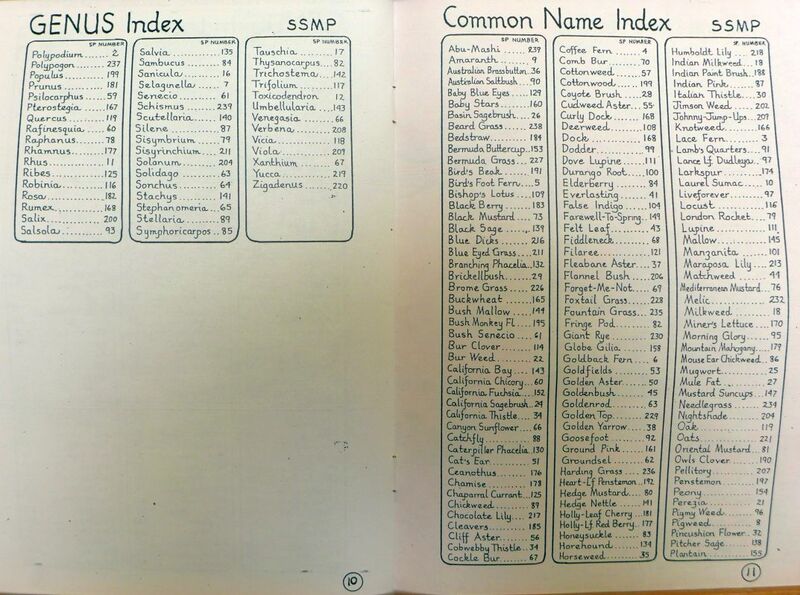 The Latin names all follow the Jepson Manual, 1993, including printed lists made prior to Jepson. The number of taxa given for each plant list counts the number of distinct species and subspecies. A detailed description of how to search these floras to find all occurrences of a given taxon is given in Search tchester.org. Mt. 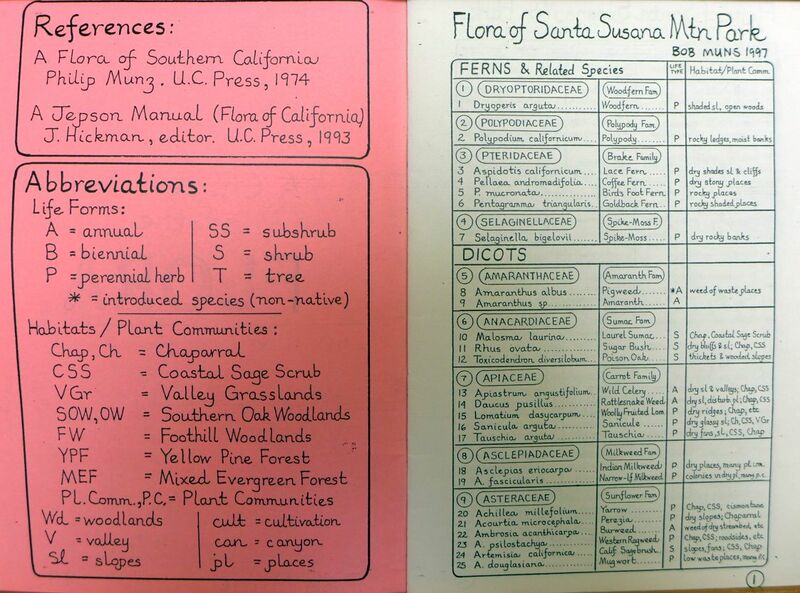 Pinos Region Flora, Ventura and Kern Counties (315 taxa, 1985). Includes summary of the major plant communities with separate lists of their typical species. Mt. Pinos Summit Flora, Ventura and Kern Counties (150 taxa, 1992, Rev. 1994). Includes plant communities above 8500 feet and mini-keys to 31 species. CNPS-scanned booklet. Santa Susana Mountain Park, Ventura County (239 taxa; 1997). No digitized version available; photos of the booklet are here: Covers; Inside Front Cover and Page 1; Pages 2 and 3; Pages 4 and 5; Pages 6 and 7; Pages 8 and 9; Pages 10 and 11; Pages 12 and Inside Back Cover. Santa Monica Mountains (Entire area; 957 taxa; 1999). CNPS-scanned booklet. Charmlee Regional Park, Santa Monica Mountains, Los Angeles County (233 taxa; 1984, 1987, 2002). CNPS-scanned booklet. Point Mugu State Park, Santa Monica Mountains, Ventura County (405 taxa; 1988). CNPS-scanned booklet. Glendora Ridge Road, 2008. CNPS-scanned booklet. Monrovia Canyon Wilderness Park (207 taxa; 2001). List by trail for Bill Cull Trail, Falls Trail, Sawpit Fire Road and Overturff Trail. CNPS-scanned booklet. Carpinteria Salt Marsh, Santa Barbara County (234 taxa; 1996). CNPS-scanned booklet. Malibu Lagoon State Park, Santa Monica Mountains, Los Angeles County (133 taxa; 1988). CNPS-scanned booklet. Bolsa Chica Marsh, Orange County (201; 1983, 1999). CNPS-scanned booklet. Torrey Pines State Reserve, San Diego County (386 taxa; 1990). CNPS-scanned booklet.